How Does Night Vision Work - Explained By Night Vision Technology Expert! How Does Night Vision Work – Explained By Night Vision Technology Expert! Human beings do not have the ability to see at night. In as much as our pupils open wider when the light is dim, they do not open much to help us see at night. This is where night vision comes in. I am sure you have seen the application of night vision technology by soldiers, pilots, sailors, movies and much more. I know you might be asking yourself whether night vision devices work and is it actually true you can see things clearly at night? If you have the right night vision device, you can see a person who is about 200 yards even on a cloudy and moonless night. This guide will help you understand more about night vision and how it works. Let us have a closer look! In simple terms, night vision refers to the ability to see beyond the normal visible light boundaries. The ability to see in low light conditions whether technologically or biologically works when there is a combination of enough light intensity and enough spectral range. Human beings can see when there is a bright light. You should know that light is always there even when it is dark only that the human eye cannot see. Image enhancement works by collecting tiny amounts of light. This includes the lower portion of infrared light spectrum available but your eyes can see. It amplifies it such that you can see the image clearly. This is a technology that captures an upper portion of the infrared light spectrum that is produced by the objects as heat instead of being reflected as light. Hotter objects emit more light as compared to cooler objects like building and trees. Most of the devices are designed with a built-in infra-red illuminator that functions as a night vision flashlight to offer more light. This helps you see clearly even in total darkness. There is a minor red dot that is seen on the front of the device when the IR illuminator is working. If you are using night vision goggles, dim light enters the front lens and this light is made of particles of light of all colors (photons). When the photos enter the night vision google, they hit a light-sensitive place referred to as photocathode. This surface converts the photons to electrons. The photomultiplier amplifies the electrons and every electron that enters the photomultiplier will result in many electrons leaving. The electrons that are leaving hit a phosphor screen to come up with tight light flashes. Because there are many photons the initial that entered the night vision goggles, the screen will produce a brighter version of the original scene. 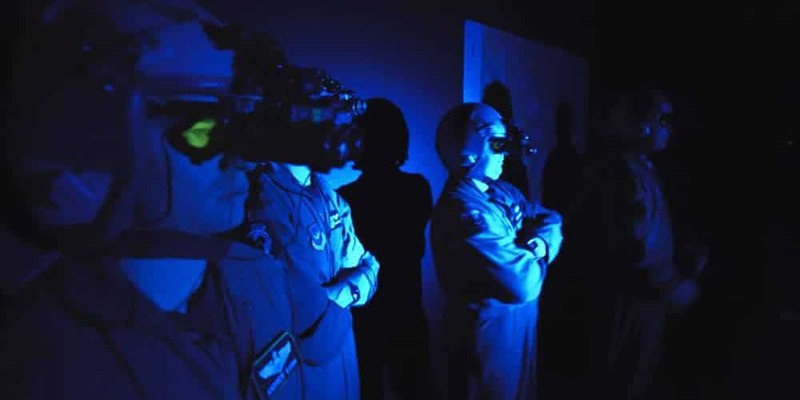 The common question that many people ask is why everything looks green when you are using night vision goggles. This is because even during the night, the photons that hit the front lens of the night vision goggle carry all colors of light. But when they are converted to electrons, there is no means of preserving that information. The colored light turns to black and white. So why doesn't night vision goggles show black and white? This is because the phosphors on the screens are selected deliberately to make the pictures look green since the human eyes are sensitive to green light and you can look for long periods. This is the main reason why night vision devices have a green glow. All the above devices amplify the existing light to help you see in total darkness. Knowing how to select the right night vision device is important. For instance, a night vision monocular is one of the most versatile devices that provide you with many advantages. The main advantage of having a monocular over other devices is that only one eye is adjusted to the ambient light. This is important if you are moving from darker to lighter conditions and night vision might not be needed. A night vision binocular is similar to the daytime binocular because it provides you with two eyepieces as well as two front lenses. It uses 1 intensifier tube meaning that it doesn't offer superb performance as compared to a monocular. The advantage is that you will get a comfortable viewing because you are using both eyes. A night vision binocular is expensive and heavier as compared to a night vision monocular. Monocular goggles- This is a goggle that has a monocular mounted headset. It is light but not comfortable since you are viewing with one eye and it also doesn't offer any depth perception. Binocular goggle-The goggles have 2 eyepiece and 2 front lenses. It offers better viewing and it is comfortable than a monocular. It also gives you depth perception because it uses 2 different optical systems. Bi-ocular goggle-The device has 2 eyepieces and one front lens. As compared to monocular goggles, this one offers a comfortable and improved viewing but no improvement in depth perception. With the help of night vision, it is easy for human beings to clear objects clearly at night. If you were wondering how night vision works, I believe you now have the right answer. I have given you a comprehensive guide so that you can understand night vision in details. I have also given you some tips that will help you select the right night vision device to meet your needs.